Notwithstanding the wealth of material published about St Clare of Assisi (1193-1253) in the context of medieval scholarship, and the wealth of visual material regarding her, there is a dearth of published scholarship concerning her cult in the early modern period. 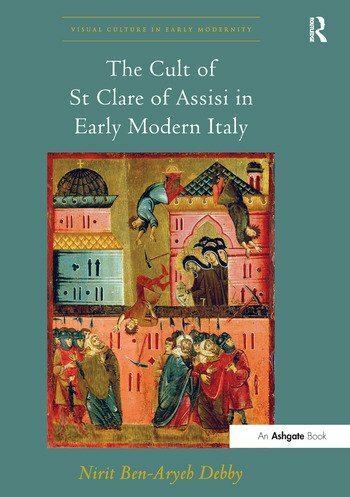 This work examines the representations of St Clare in the Italian visual tradition from the thirteenth century on, but especially between the fifteenth and the mid-seventeenth centuries, in the context of mendicant activity. Through an examination of such diverse visual images as prints, drawings, panels, sculptures, minor arts, and frescoes in relation to sermons of Franciscan preachers, starting in the thirteenth century but focusing primarily on the later tradition of early modernity, the book highlights the cult of women saints and its role in the reform movements of the Osservanza and the Catholic Reformation and in the face of Muslim-Christian encounter of the early modern era. Debby’s analyses of the preaching of the times and iconographic examination of neglected artistic sources makes the book a significant contribution to research in art history, sermon studies, gender studies, and theology. Nirit Ben-Aryeh Debby is Senior Lecturer in the Arts Department at Ben-Gurion University of the Negev, Israel.